The Trainer Snippets report shows that Dan Skelton has a brilliant record when inheriting horses from other yards. From his last 87 such runners, he's had 27 winners (31.03%) and 47 places (54.02%) for level stakes profits of 7.44 and 9.78. This has also produced an Impact Value of 3.44, meaning he is almost three and a half times more likely than average to have the winner. Away For Slates has his first run for Skelton today so we will have a closer look at him. Away For Slates has been off the racecourse for over 600 days, but his was looking good prior to his absence and won a handicap hurdle as easily as he liked last time out at Sedgefield. He races from the same mark today, therefore, if Skelton has managed to get him match fit for today he could be a big player in this one. Dan Skelton has been in excellent form recently, with 11 winners (27.50%) and 22 places (55.00%) from 40 runners over the past couple of weeks, which have produced level stakes profits of 8.81 and 23.82 respectively, and an Impact Value of 2.78. 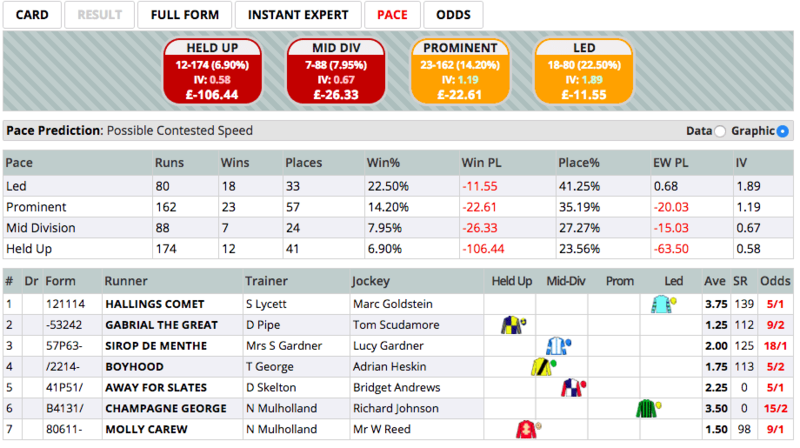 Although he doesn't send his runners here that often, he also has s useful long-term record at Lingfield. Over the past five years he is 5/11 (45.45%) for 14.00 points and an Impact Value of 3.79. When looking at the Instant Expert report we can see that there are a few runners that come out better than Away For Slates. He does have two sections of green and one of amber though, so looks reasonably well suited to today's conditions. The Pace report shows that early leaders here over this distance have a decent record, with 22.50% of them going on to win the race, for an Impact Value of 1.89. Hallings Comet is usually a front runner but today it looks a possibility that he may have a battle for the lead with Champagne George. It is tough to know what Away For Slates is going to do, but it wouldn't surprise me to see Bridget Andrews take up a prominent position early on. Click here for the 15:20 at Lingfield.